How do we ensure we are savvy in our use of technology to accelerate student learning gains without it becoming a gimmick? Just because young people today have grown up with technology it doesn’t mean they’re experts in its use for their own learning. So using our deep pedagogical knowledge, how can we address this? 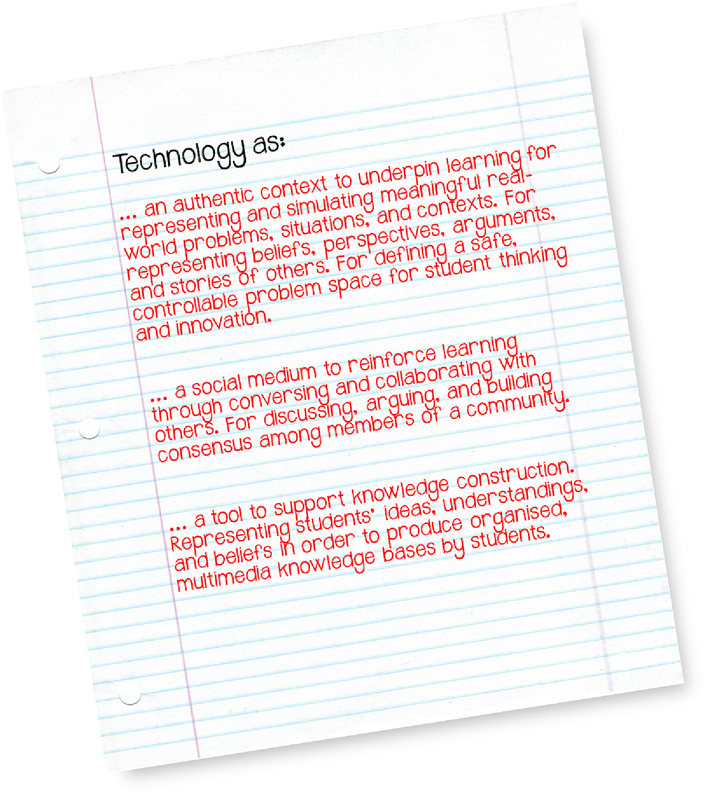 The current rate of acceleration of technology is disproportionate to that of pedagogical development in teaching practice, this is a prohibiting factor in truly integrating technology in learning. Research supports this hypothesis and a recent ISTE study suggests that 77% of teachers say technology use in the classroom motivates students to learn and 76% of teachers say technology allows them to respond to a variety of learning styles, this is encouraging, but what about learning gains leading to student progress? More worryingly, schools in England alone spent more than £1.4bn on technology in the past three years but they claim that all too often it is not being used to its full promise and potential (NESTA). Not only do we have a moral obligation to spend public money effectively, we also need to integrate technology to enhance and accelerate learning gains and not to simply replace or mask poor pedagogical practice. I believe we need to meet in the middle and hit the ‘sweet spot’. 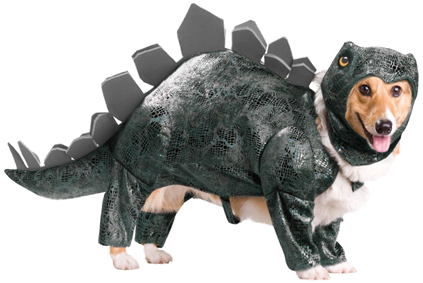 Is technology wagging the pedagogy dog’s tail? Therefore technology should function as a tool kit allowing itself and learners to be intellectually linked, where the cognitive responsibility for performance is distributed by the component that performs it better and not replace it. 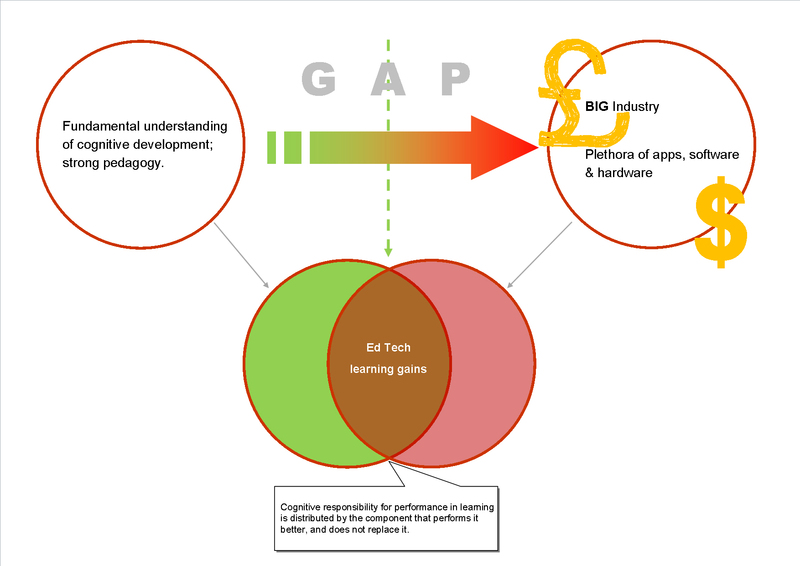 It’s a fact that there is currently a profound skills gap in the teaching profession when it comes to the use of technology. This is a generational thing, which has coined the phrase “digital natives” with regards to our students. What bothers me is when this ‘net’ generation are considered to learn differently to other people, this is absolute rubbish. There is little evidence to suggest that the human brain has evolved significantly in the last 50 years, moreover, our capacity to learn remains the same as it did before digital technologies became so widespread. One theory could suggest that young people today have developed an ability to focus their attention differently. Nevertheless, the cognitive developmental capabilities of young people are fundamentally the same as 50 years ago. Furthermore, we mustn’t assume that because young people have grown up in technological evolution they are experts in its use for their own learning. Professional development is crucial not only to teachers’ practice but whole school improvement as well, this is common sense. We could also argue that as the teaching profession gets younger (don’t get me started on the recruitment crisis) this will inevitably go away. This would be short sighted and foolish to assume that learning has changed now we have access to knowledge through the internet, and that today’s children/young adults don’t need to know stuff, they just need to know where to find it. Again, absolute rubbish, this totally depends upon the context in which this is being used, for example, finding out factual information on a new car you’re purchasing would be fine, but would you want your dentist using Wikipedia to brief themselves before your next root canal surgery! Don’t get me wrong, I’m a huge advocate for educational technology and totally believe in developing our students to be responsible, safe, ethical and savvy users of technology. But, with regards to teaching and learning, this operational element needs to be underpinned by a sound pedagogy and not used as a substitute for it or to mask poor practice, otherwise it’s simply a gimmick, encouraging compliance but adding no educational value to students learning and therefore outcomes. 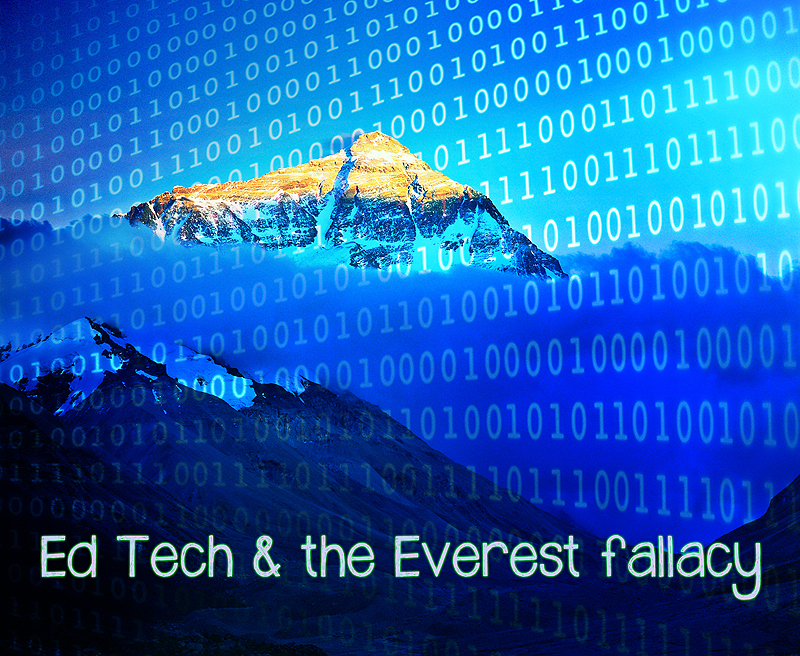 **The Everest fallacy is a little-known name of an often made logical fallacy: the confusion of the exception with the norm. Nothing controversial here at all Gary. You’ve used a number of references to point to something which is simply this; teachers need to be given the time and training to learn and gain confidence in effectively using technology. The formula is simple too – it’s not about the bells and whistles of amazing things when it comes to teaching (and learning) with technology. The best tech is often that which has low access (i.e. it is simple use) but with high challenge (i.e. the potential outcomes are huge). It’s about time government (and many schools) recognised the potential; in particular, the need to have edtech training as an essential part of PGCE courses and Qualified Teacher Status. I completely agree and have been arguing that the uses to which technology has been put in education fall far short of the potential and even its use in industry and sport! I’d avoid mentioning ‘learning styles’ like the plague, though!